UPDATE: Apple Fixes Eavesdropping Bug. Apple has released an iPhone update to fix a software flaw that allowed people to eavesdrop on others. Callers were able to activate another person's microphone remotely when using Group FaceTime, even before the person had accepted or rejected the call. 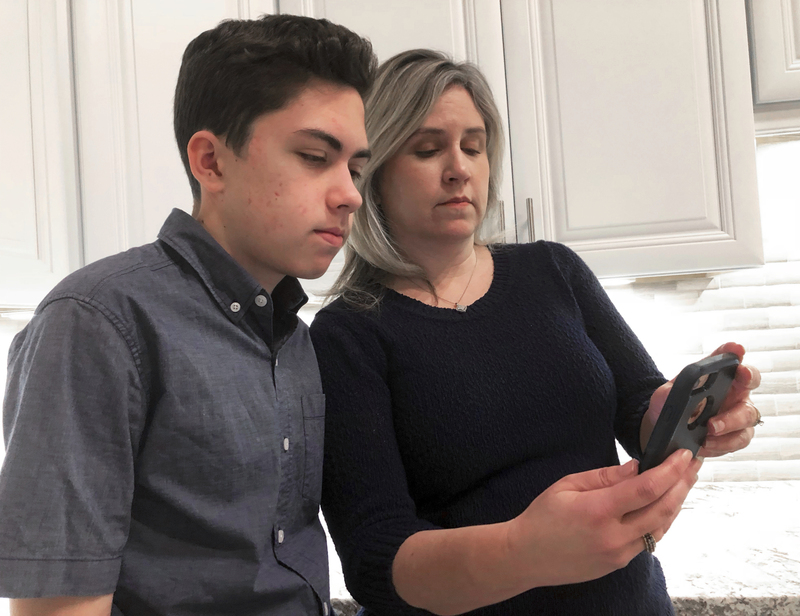 Apple turned off the group-chat feature last week after 14-year-old Grant Thompson of Tucson, Arizona, discovered the flaw. The Thompsons had tried for over a week to alert Apple to the bug. The company was widely criticized for its slow response. Apple plans to contribute to Thompson's college fund in addition to paying a bounty to him and his family for reporting the privacy flaw. The amounts were not disclosed. Such bounties are commonly awarded to users who discover and report software flaws. Grant’s mother, Michele, told The Associated Press that the family intends to use all of the Apple money to help cover his college expenses. The FaceTime repair is included in the latest version of Apple's iOS 12 system, which became available to install Thursday, February 7. Apple has a bug. An eavesdropping glitch turns an iPhone into a live microphone during FaceTime. And a 14-year-old boy may have been the first to find the flaw—more than a week before the tech company took action. What’s worse, Grant and his mom, Michele, spent a week trying to get Apple to do something about the problem. The bug allowed callers to activate another person’s microphone remotely before the person has accepted or rejected the call. The family tried reaching Apple through multiple channels. They left comments on Twitter—one to CEO Tim Cook—and uploaded a video to walk Apple engineers through the problem. But it wasn’t until a tech blog reported the flaw that Apple shut down the group-chat feature. Grant is a straight-A student who plays basketball, does community volunteering, and enjoys video games. He was using FaceTime to call friends to play a game on January 19 when he discovered the flaw. Apple plans to turn FaceTime group video chat on next week via a software update. But the slow response will likely land them in court. That is a long time for apple to ignore them. It doesn’t seem fair that that guy was ignored and that apple did not do anything until the tech vlog said something. Apple needs to step on it and get something done about the glitch. Yea, I agree with you all too! I don't have a phone, but that would be weird if I could hear people with their microphone! Oops, I guess I mean, it would be weird to hear people with their microphone before I start chatting with them. Personally I do not agree with all of you. Why would you even care. It also makes sense why Apple would not want to respond. Why spend millions of dollars because a teen finds it annoying. People today look over the reasonable stuff and instead see the bad of not responding to a 14 year old. If I were in Apples shoes I definitely would have done the same exact thing. Like I said If Apple needs to fix it let them! But why would you even care. Oh and not to mention this could be a whole mistake by the teens part. Sorry but I have my opinion you have yours. I am not trying to have grudges but I think people only want to hear their opinion and not mine. So please tell me in comments wether you agree with me or not! Oh and by the way eighth comment! I am also an avid newsreader of this and a Harry Potter fan narnia and the Lord of the Rings. I wonder if they will go to court. I use FaceTime a lot with my friends (not for video games though. But my brother does). I"m surprised that Apple didn't work on it faster! The reason I think they should have fixed this bug earlier, is because it allows other people to eavesdrop on other people with out them knowing it, potentially listening to private information. Also, since most people carry their phone around with them, the person who is eavesdropping can listen to them wherever they go! But this is just my opinion. Yeah, I'm with Anna C. They should have fixed the problem as soon as they were told about the glitch. It is pretty amazing how many comments this news bite has considering it has only been on for 2 days! I agree. There really does need to be a better way for citizens to really have a better way to contact companies and not be ignored for a week and a half. I think people take these things way too seriously. And to got to court is ridiculous! Just calm down. whoa. I have an Iphone but I don't want to download the new update because I like using Group Facetime. Timothy, you can still group chat with the update, it just fixes the glitch. I agree with you to a certain extent. I see what you're saying about Apple having bigger problems and stuff but it was kind of rude for them to not even respond on the first day, Saying something like 'hey, we'll look into it' and just saying that they're busy would've been appreciated I bet. It's not bad that they didn't respond but it was rude. Especially, when we can bet that Apple got their messages the first day but somebody just figured it was not important. Like you said, nobody's noticed it before so its not really that big of a deal. I am not angry but just saying, Just because he is a teenager doesn't mean Apple should ignore him! It's rude no matter what his age and they should have given him some sort recognition, like, "We'll check it out", or "We'll look into it"